With its practical kitchen with dual-fuel hob, big fridge, light, bright lounge, programmable Alde central heating and spacious rear dressing-showering room, this is a luxury touring caravan. Add in the greater stability of two axles and the plus points of this caravan tot up even higher. There are caravan insurance discounts available too, thanks to its AL-KO secure wheel lock and infra red tilt sensor alarm. Swift’s designers have given a lot of thought to small details that add up to a Sterling Elite Explorer loaded with convenient features. For example, the microwave is about 10cm lower than is usual in caravans, a safety point that will be appreciated by short-stature buyers. But the flagship-bracket, high-spec Explorer also exhibits three cheap-looking visual features which we find surprising in a caravan of this price. All of them are plastic – and, in our eyes, all of them matter. The most obvious is the brown plastic moulding which forms the bed. It looks more bath tub than bed base. The second plastic moulding we dislike is also in the bedroom. The wheel arch intrudes into the base of the triangular dressing table. But instead of making the woodwork fit the wheel arch, thereby hiding it, the designers have interrupted the cabinetry and allowed a large section of wheel arch to protrude. They’ve covered it with the same plastic as the bed base. The third plastic intrusion into the looks of this otherwise refined caravan is common to all the Sterling Elite and Swift Conqueror caravans. All have plastic mouldings beneath each front side window. Their colour doesn’t match that of the central phone-charging arrangement and they’re held in place by undisguised screws. There are many details we do like though. The retracting transverse bed concept is utterly brilliant. In day mode the bed is about 15cm shorter than at night. That creates extra corridor space to the shower room. The spec list is a long one and contains some important stuff. Alde central heating and a 40-litre water tank make the Explorer ideal for year-round caravanning. Next in importance has to be the tower fridge with its separate freezer. The corner dressing table has two mains sockets and there are TV points here, too. We also found that the caravan’s sun roof keeps the front end light for longer into the evening than models without this lovely feature. But the bedroom soon began to need a boost from the 12 volt system as daylight receded because there is only one window. And, we discovered, only three small spotlights plus mood lighting above the lockers. We used a dressing table lamp so problem solved. The Explorer is by no means alone in lacking brightness in the bedroom; in this model, the rectification is easier than most as there’s a dressing table that might well have been designed with a lamp in mind! 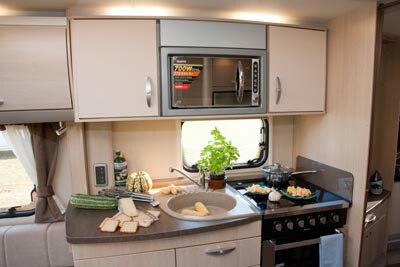 On the whole, this big, stunning-looking grey-sided Swift with its deep grey and black exterior styling is a true example of caravanning excellence. 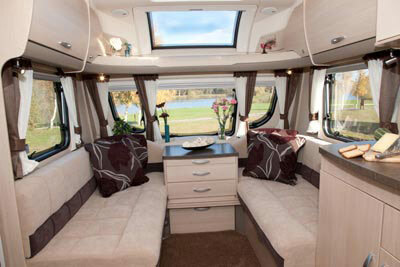 And the caravan insurance discounts available are favourable too! 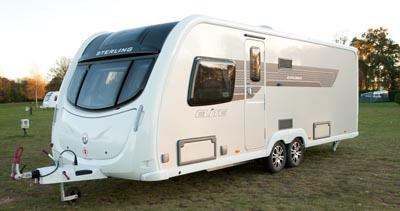 *Caravan insurance cost based on 2011 Sterling Elite Explorer valued at an estimated £21,308, fitted with hitchlock, Al-Ko secure wheel lock and alarm (Al-Ko and alarm are standard on this model). Also fitted with approved tracking device. Kept on drive at HX4 0BE behind 24 hour locked gates. Caravanners over 30 years old, claim free for 3 years and a member of a caravanning club. Premium includes online discount of 10% and insurance premium tax at 6% and is correct as of 18.03.11. We allow for the fitment of an air conditioning unit by removing the skylight above the kitchen area. There is a complete frame around this 400×400 aperture for securing the unit, and generally, installers will take a 230V power supply from the microwave socket, located in the upper locker of the sink unit. This van seems to tick all the boxes but as I will be using it in the South of France where I live, It really needs to have air conditioning. Swift say it can be added but didn’t give any information about how a where I could order the unit etc. Can anyone help ?? Before I finally decide to buy!!!!! Thanks for getting in touch. Let me pass your query onto Swift to see if they have further info. If not, hopefully someone here on the blog can help. We have just exchanged our Compass 634 ralley with fixed bed, after 3 years of climbing over for the loo, the new Exporer is (perfic) .the plastic around the Bed?? well it’s not as UNSIGHTLY as splitting and cracking laminate . Anyway if you fit a valance around it ( now it’s hidden ) the + outway the – = Beautiul ,My wife Loooves it. Just traded in 2010 sterling elite for new sterling explorer, love the new look hope to have as much pleasure with this one. I purchased a brand new Sterling Elite Explorer 2011 having previously owned a Swift conqueror 630 (2008) which we loved & kept for 2 years. The new Sterling is BRILLIANT! It is all about personal choice but we love the light pine wood colour as is creates a real modern contempary feel. My wife can access the washroom at night from either side of the bed where previously complained about having to climb over me in the Conqueror 630 . I am 6′ 3″ tall & cope with the transverse bed without any issues. I was disappointed that there was no omnivent in the spec so had that fitted prior to collection & put the heki vent into the bathroom which really makes the caravan look like the TOP van it truly is. Impala fabric is a must as my daughter has already truly put it to the test & ………………….. it works. I also had the ATC fitted & towing with my VW Touareg makes the whole experience second to none. Some interesting comments above, but I have the Conqueror 645 and the layout is superb, in fact, it is a stunning caravan – and you can leave the bed in its night position and still get to the bathroom without climbing over the bed !! My hubby and I looked around this van, he is not overly tall 6ft but his feet dangled over the end of the bed, he wouldn’t even be able to sleep diagonally. Don’t like they light cheap looking interior. Picture window takes away some of the overhead storage. We are sticking with our 2006 Sterling Elite Searcher with a “proper” fixed bed. Love the concept of bed accessible from both sides, but hate the plastic “bathtub” & other plastc mouldings, Have brought the Lunar version, Sorry !!!!!!!!!! A very nice van but don’t the idea of going into bedroom to get to bathroom, to pricey for us , as caravaning is getting more expensive anyway, as we would need to buy a bigger more expensive car to tow it with. plus more petrol , Think we will stick with our old faithfull ace diplomat still in good nick for a while yet . What a fantastic caravan! this would be our ideal van as we have an Olympus 534.The only thing i dislike is the exterior decals too dark and thick! 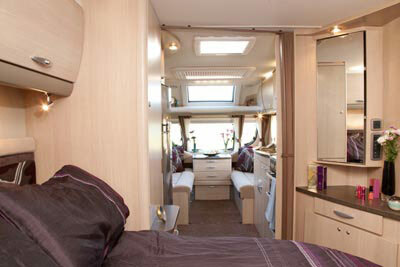 Brilliant caravan but prefer Swift version as I personally dislike the light colour interior of Sterlings. And what do you do with the long mattress/cushion during the day ? The idea of a fixed bed to me is that it’s a “fixed bed” not to have to mess about with inserting a cushion,sorting out your sheet etc etc. The work top space leaves alot to be desired once you have a kettle plugged in. Very difficult to put 2 plates out for serving onto let alone 4 when having friends round. 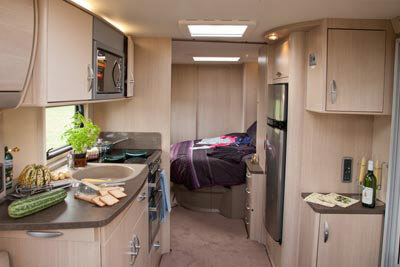 Again another comment re lack of lighting why oh why do caravan designers scrimp on lights ? Does this mean that, as in the new Baileys, the person furthest away from the loo has to jump over to have a pee? Caravans are getting ever more pricey. Who can afford such prices? Owning one will surely lead to more debt.